This course presents a neuropsychological and interdisciplinary approach to brain injury treatment. 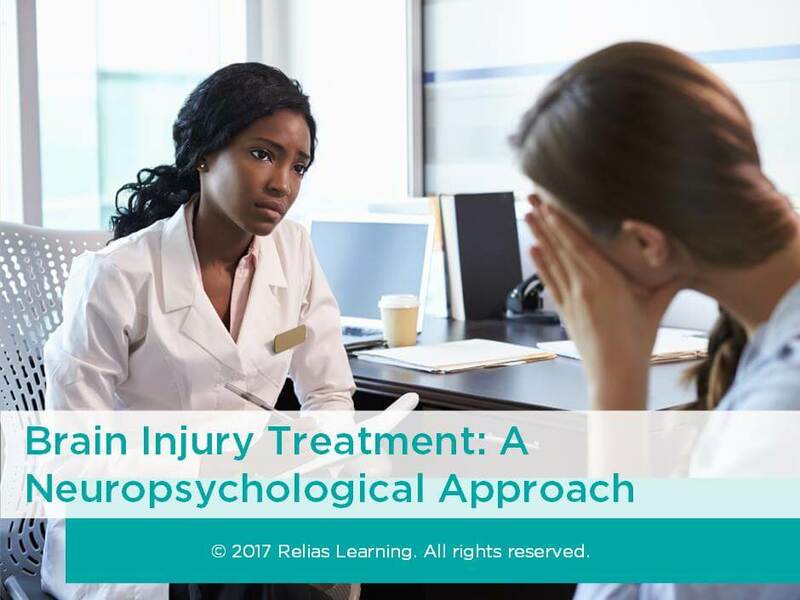 It first provides an overview of neuroanatomy, brain injury, and neuropsychology, and then focuses on how healthcare professionals can use this information in their clinical practice. In this course, you will learn how to apply information from neuropsychology to improve your treatment approach for persons with brain injuries in all types of healthcare settings. This course has been approved by the Alabama State Board of Occupational Therapy for 1.50 contact hours, approval number 20-610544. This course has been approved by the Florida Board of Occupational Therapy for 1.50 contact hours, approval number 20-610544. This course is approved by the Ohio Physical Therapy Association, approval number 18S7646. This activity is approved for 1.50 contact hours. This course has been approved by the West Virginia Board of Physical Therapy, approval code REL-R19-04. Approval of this course does not necessarily imply that the WV Board of Physical Therapy supports the views of the presenter or sponsor. This activity is approved for 1.50 contact hours. Name 4 anatomical areas of the brain and their primary functions. Describe 3 types of brain injuries and possible sequelae. State 3 elements common to the practice of neuropsychology. Define 3 types of learners and their common characteristics. Explain 4 strategies based on neuropsychological findings that healthcare professionals can use in their clinical practice. Describe 2 elements that are important for setting goals. Identify 2 factors that may impact family function for people with a brain injury. Identify 2 factors that may impact employment for people with a brain injury. Explain 2 special considerations for working with people with mild traumatic brain injury or concussion. Erica Gaskins earned her Doctor of Physical Therapy degree from the University of North Carolina at Chapel Hill, after graduating from Wake Forest University with a Bachelor’s degree in health science and neuroscience. Erica has experience working with patients with various neurologic impairments and her advanced training includes the Multiple Sclerosis Certified Specialist (MSCS) designation. Her main clinical interests include balance and gait training for people with neurological problems and promoting health and mobility through exercise and wellness programs. She is passionate about education, community service, and healthy lifestyles. Disclosure: Erica Gaskins, PT, DPT, MSCS has declared that no conflict of interest, Relevant Financial Relationship or Relevant Non-Financial Relationship exists. The target audience for this course is: entry and intermediate level Physical Therapists; entry level Nurses; in the following settings: Post-Acute Care.